Be warned Federal Labored Labor: your troglodites and that atavistic world's best treasurer should be made aware that his favourite abused term 'vested interests' is merely a trite, childish example of communism / socialism. Indeed the terms are intertwined: remember what the USSR stood for? Yea, he proudly announces extreme leftist ideas: t'is indeed the proletariat's excuse for a 100 year plan of global lunacy. AKA climate tax. In case Gillard's cadres ever get an original viable idea - here is a troika to help with more. Intelligent, informed people rail against the taxing of hot air. Trading hot air as a purported deliverable, permit based commodity is pathetic and worse. And try to tell the truth once in a while. If you do not heed these salient words we may have to contemplate a new opposition party. Look up troglodyte in Wiktionary, the free dictionary. "Atavistic" redirects here. For the record label, see Atavistic Records. For the Slough Feg album, see Atavism (album). For the Otep album, see Atavist (album). 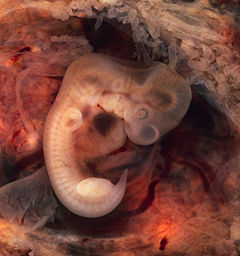 Early embryos of various species display some ancestral feature, like the tail on this human fetus. These features normally disappear in later development, but it may not happen if theanimal has an atavism. Atavism is the tendency to revert to ancestral type. In biology, an atavism is an evolutionarythrowback, such as traits reappearing which had disappeared generations before. Atavisms can occur in several ways. One way is when genes for previously existing phenotypicalfeatures are preserved in DNA, and these become expressed through a mutation that either knock out the overriding genes for the new traits or make the old traits override the new one. A number of traits can vary as a result of shortening of the fetal development of a trait (neoteny) or by prolongation of the same. In such a case, a shift in the time a trait is allowed to develop before it is fixed can bring forth an ancestral phenotype. Evolutionarily, traits that have disappeared phenotypically do not necessarily disappear from an organism's DNA. The gene sequence often remains, but is inactive. Mathematically, such an unused gene has a reasonable probability of remaining in the genome in a functional state for around 6 million years, but after 10 million years it is almost certain that the gene will no longer function. As long as the gene remains intact, a fault in the genetic control suppressing the gene can lead to it being expressed again. Sometimes, dormant genes can be induced to be expressed by supplying the stimuli artificially. Atavisms have been observed in humans as well. Babies have been born with a vestigial tail, called "coccygeal process", "coccygeal projection", and "caudal appendage". It can also be evidenced in humans who possess large teeth, like those of other primates. In addition a case of "Snake Heart" has also been reported in medical literature. In addition, the concept of atavism as part of an individualistic explanation of the causes of criminal deviance was popularised by the Italian criminologist Cesare Lombroso in the 1870s. He attempted to identify physical characteristics common to criminals and labeled those he found as atavistic, 'throwback' traits that determined 'primitive' criminal behavior. His statistical evidence and the closely related idea ofeugenics have long since been discredited, but the concept that physical traits may affect the likelihood of criminal or unethical behavior in the individual strangely still has some scientific support. The notion that somehow, atavisms could be made to accumulate by selective breeding, or breeding back, led to breeds such as the Heck cattle. This had been bred from ancient landraces with selected primitive traits, in an attempt of "reviving" the extinct aurochs. The term atavism is sometimes also applied in the discussion of culture. Some social scientists[who?] describe the return of older, "more primitive" tendencies (e.g. warlike attitudes, "clan identity", anything suggesting the social and political atmosphere of thousands of years ago) as "atavistic". "Resurgent atavism" is a common name for the belief that people in the modern era are beginning to revert to ways of thinking and acting that are throwbacks to a former time. This is especially used by sociologists in reference to violence. The neo-pagan subculture also uses this same terminology ("atavism" or "resurgent atavism") to describe how modern, Western countries are experiencing both the decline of Christianity and the rise of religious movements inspired by the pagan religions of centuries past. Some cite the rise of environmentalism, scientific inquiry, and liberalization of society as contributing to an increasingly secular society, one in which religious sentiments are more frequently tied with an appreciation of the physical world rather than set against it.Occasionally, the use of these terms in reference to "alternative" spirituality or in an occult context implies the use of violence to assert these changing religious views–for example, in the book Lords of Chaos a rash of church burnings across Scandinavia has been described as a part of this trend because many of the perpetrators were self-described "pagans" seeking to overthrow what they deemed to be centuries ofreligious oppression by Christianity. Atavism is a key term in Joseph Schumpeter's explanation of World War I in 20th century liberal Europe. He defends a liberal view of international relations that an international society built on commerce will avoid war because of war's destructiveness and comparative cost. His reason for WWI is termed "atavism", in which he claims the vestigial governments in Europe (the German Empire, Russian Empire,Ottoman Empire, and Austro-Hungarian Empire) pulled the liberal Europe into war, and that the liberal structure of the continent did not cause it. He used this idea to say that liberalism and commerce would continue to have a soothing effect in international relations, and that war would not arise in nations who are built on commercial ties. Hunter S. Thompson used the phrase "atavistic endeavor" in many of the pieces he wrote and the phrase is still strongly associated with him. ^ a b c "Multi-cell Organisms" . Universe-review.ca. Retrieved 2011-09-29. ^ a b c d TalkOrigins Archive. "29+ Evidences for Macroevolution: Part 2" . Retrieved 2006-11-08. ^ Held, L. (2009). Quirks of Human Anatomy, an Evo-Devo Look at the Human Body. Cambridge University Press. ISBN 978-0-521-73233-8. ^ David Biello (2006-02-22). "Mutant Chicken Grows Alligatorlike Teeth" . Scientific American. Retrieved 2009-03-08. ^ An example of this usage of the term can be found in Friedrich A. Hayek (1978). "The Atavism of Social Justice". New Studies in Philosophy, Politics, Economics and the History of Ideas. Chicago: University of Chicago Press.